Home / News / China to See AFL’s Best in Metz! China to See AFL’s Best in Metz! “He’s a beast, with a high speed motor.” That’s Ron Jaworski, one of the NFL’s authorities speaking about Jake Metz, who has his bags packed and is ready to terrorize the quarterbacks of the CAFL. At 6-football-6 inches tall, and with 266 pounds of chiseled muscle, Jake Metz is a man hungry for more success. And that is hard to fathom. 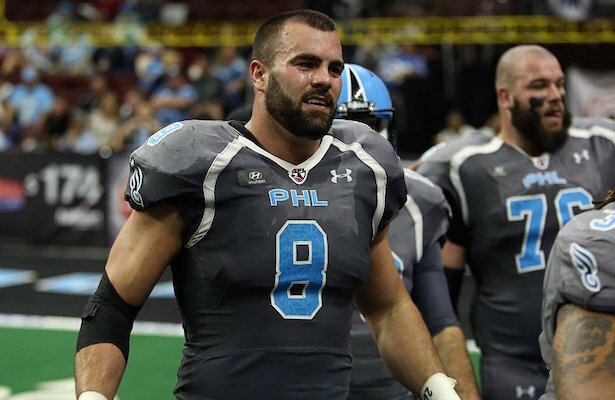 Considerer this, in the last 2 weeks alone, Metz finished his second season in pro arena football as the leader in quarterback sacks, was named the AFL’s Best Defensive Player, helped lead the Philadelphia Soul to the AFL championship and then was signed by the Philadelphia Eagles of the NFL, in his hometown of Philadelphia. In the the AFL’s nationally televised championship game on Friday August 26, Metz forced a fumble and bagged another sack, setting the tone for the Soul’s win over the powerful Arizona Rattlers. He barely had time to celebrate the championship and return to Philly before the Eagles called for a Monday morning tryout. They signed Metz that afternoon, and on Thursday he played more than a half against the New York Jets in the Eagle’s final exhibition game. It was a long shot for Metz to make the roster for the regular season, and he was cut. Now the Eagle’s loss is the CAFL’s gain. It has been a cinderella story for the Souderton, Pa native who played his college ball in-state as well. In fact, every snap of his football life has been for a team based in Pennsylvania. No more. His next play will occur Saturday, October 1, in Beijing, in the People’s Republic of China. Want to bet the change won’t slow him down?